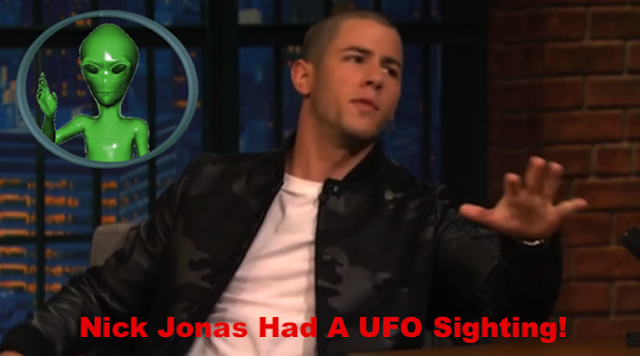 UFO SIGHTINGS DAILY: Nick Jonas Says He Saw Three Flying Saucers When He Was 14, Sept 2015, Video, UFO Sighting News. Nick Jonas Says He Saw Three Flying Saucers When He Was 14, Sept 2015, Video, UFO Sighting News. I think its a great deed when a person comes forward and tells others about their UFO experiences. It takes a lot of courage to push forward and risk the ridicule and laughter from the people around them. Here Jonas clearly doesn't care what others think, but instead, says it like it is. That he saw three flying saucers in the sky. That is cool. And to top it off, he went on-line to confirm those UFOs were seen in three other states that day. The Internet is going to force disclosure very soon. PS, sorry about the video difficulty, its the source problem, not our sites problem. See the video on original site for a larger size. When Demi Lovato last visited Seth Meyers, she told the Late Night host all about her belief in extraterrestrials. But far from disabusing her of that notion, her pal Nick Jonas tells Seth he had a close encounter of his own, once spotting THREE UFOs at once! Ch-ch-check out the extraterrestrial interview (above)!